Do not know what to buy someone for Christmas? £60 per session (value £85) until we clear your Problem / Pain. (Most people require only three sessions and nearly all have less than 5 sessions). I will clear the underlying cause of your Problem / Pain and you will have inner peace. I clear you on all levels of your being and can see when the underlying cause has gone. We will clear your Energy, Programming, Conditioning, Ancestral Energy, Thoughts, Emotions, Beliefs and Behaviours for you to be pain FREE and enjoy your life NOW. If you need to be inspire or you want to uplift someone, what better way then me reading what their gifts and unique abilities are? Only £40 (Value Priceless). Skype sessions only, Available Word Wide. You need to come to my clinic which is in a beautiful village 2 miles from Luton Town Centre and only a 15 minute drive from Harpenden. Yes I am a qualified physical therapist see www.RealEnergy4u.co.uk for more details. 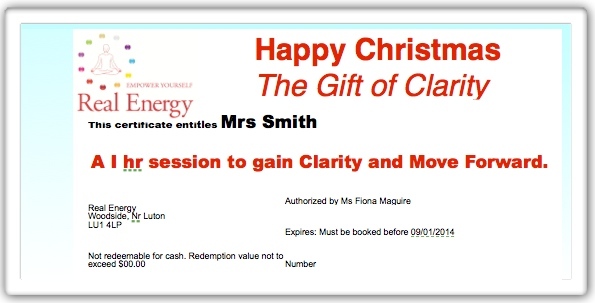 To buy as a gift certificate and print it of yourself (you could even do this Christmas morning – though I would do it Now) click button below and pay £40.